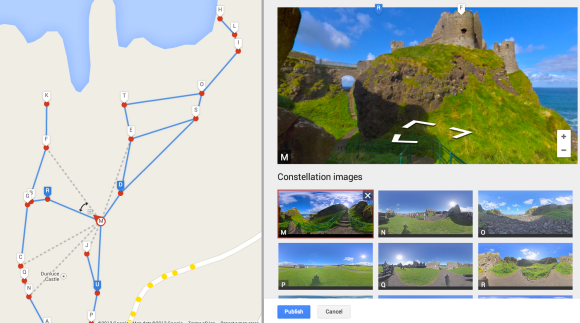 Google Maps Views has a new feature that lets you connect your photo spheres and create constellations. "By connecting your photo spheres you can create even more immersive, 360° views called constellations. You can choose to add your 'constellations' to Google Maps, so people can explore your favorite places on Maps. Keep your constellations private or share them with others on Google Maps or Views," informs Google. This article has more information about changing photo sphere locations, rotating photo spheres in the right direction and connecting them. You can use multiple photo spheres to create your own Street View imagery. Here are some examples: Google Boulder, Android Building, Carrick-A-Reed, Dunluce Castle, Asilomar Beach. Press the arrow icons to move between photo spheres.